Many citizens have left downtown areas for the suburbs. In addition, many businesses have moved to the shopping malls. Much of this was caused by the development and expansion of our nation’s Interstate Highway System, a product of the mid-1950s, which is still evolving. Traditionally, a family wanted to raise its children in a single-family house with a yard, away from the traffic and noise of the downtowns. This seemed like the “American Dream” for many years, but is now changing. As our highway system expanded, many residential subdivisions developed in the suburbs. This trend went on for several decades. When our parents were young, there was typically one car in a family. As mothers went to work, they acquired cars. Today, it seems like many children over the legal driving age have cars. Older citizens recall seeing old homes with single car garages, newer homes with two-car garages and more recent homes with three-car garages. A colleague was recently visiting one of our nation’s growth states, and saw new homes with four-car garages. Wow! There are families where the children have grown. They would like to relocate in urban downtown areas. There are young professionals that would like to focus on their respective jobs before starting a family. They wish to locate in inner-city areas and relocate to the suburbs later in life. Another group of folks would like to live their lives without having a vehicle. Thus, the growth of a new type of residential developments around public transit stations called Transit Oriented Developments (TOD’s). There is also a rapidly developing market for condominiums and townhouses that are located next to light-rail public transit systems. There is a national need, a community one too, to make downtowns attractive, which requires a redevelopment effort to make them livable. Such positive movements require states, and their local governments, and especially those folks who are responsible for managing downtowns, to advocate for changes that will benefit downtown areas. We think history has come full circle in this regard. We were recently looking at a century-old picture of a high-rise residential area in the lower east side of New York City. Individuals and families lived in several story residential structures, with an assortment of commercial businesses located on the ground floor. All of the restaurants, markets and other commercial activity took place at street level. Then, over the years, we separated our land uses as we imposed pyramidal zoning on our cities. After all, you would not want citizens living in commercial or industrial areas. This way of thinking is now rapidly changing. If communities want to revitalize their downtown areas, they must change their zoning laws to allow for mixed-uses of commercial (on the ground floor) and residential (on the floors above that). In addition, arts, entertainment and culture are coming back to downtown areas. Citizens have seen their city officials using libraries and museums as tools to stimulate economic development. Moreover, cities are trying to lure educational institutions and nonprofit organizations back downtown. We recently read where some states are even relocating some of their offices from the suburbs back into their downtown areas. There’s also a big push preserve nature in our downtown areas, restore what has been removed and expand various aspects of nature. This includes parks, wetlands, waterways as well as ways to enhance pedestrian movement using walkways, bikeways, plazas and the widening of public areas. 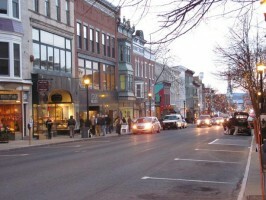 Many citizens have thought that cars designed their downtowns. It seemed like people were a secondary consideration. Streets are now getting narrower, as well as are the number of lanes used to accommodate traffic. Sidewalks are now getting wider – as well as greener. This trend has facilitated the movement of people back to our downtown areas. It’s also great for those commercial businesses established on the ground level to have their market built-in around and above them. Rezoning them and placing residential units above them is the wave of the future. If you build them, people will come, especially if there’s public transit in the area. Restoration and enhancement of all aspects of nature. Buildings that have mixed-uses, and are multi-story in height. Restoration of the public infrastructure to favor people over cars. Combine landscaping with the restoration of all aspects of the public infrastructure. Conversion of surface parking to parks, gardens and open spaces. Attraction of culture, arts and entertainment amenities and facilities. Attraction of educational institutions and nonprofit organizations. Smaller, specialized shopping malls downtown. Focus downtown on ethnic and niche stores, such as markets, delicatessens, bakeries and restaurants. Restoration of a sense of “public place” in the core of our “new” downtowns. Sales tax rebates, low-interest loans and property tax incentives, usually in the form of reductions or rebates. Grants for “high priority” projects. Construction of “on-site” improvements, such as parking garages. Construction of “off-site” improvements, such as utilities, roadways and signalized intersections. Provision of a “user-friendly” development process. Zoning to accommodate “mixed” land-use developments. Public investments in downtown improvements. Programs to market the “new image” of your downtown. To sell economic development incentives to local public officials, they must be reasonable as well as have a long-term benefit to the taxpayers. More importantly, public officials must feel comfortable with such incentives and believe they will improve their downtown. They must also benefit all of the citizens within the community. A nice downtown should not only serve as a great public place for those that live there, but for other individuals and families as well. They should not only be attracted to “their” downtown, but they should also feel comfortable within the entire inner-city area, including the surrounding neighborhoods. The various trends outlined above, when facilitated by local public officials, will make these trends a common reality. Public officials, both elected and appointed, should always keep in mind that prudent economic development incentives are a wise way to increase a local government’s revenues without raising its taxes. During these difficult economic times, the above practices should be embraced and facilitated by politicians, downtown professionals and citizens alike. They will assist in balancing their community’s budget with the increased revenues that result from renewing a community’s downtown. Most cities evolved piecemeal over the years and now need to be retrofitted and redesigned for the future. Planning, zoning and building laws and regulations should be in place to accommodate mixed land-uses, infill development and redevelopment projects. The practices facilitated by these downtown revitalization trends can be applied to projects of all sizes — from a single building, to a full block, to a neighborhood, and even to an entire community. Call it new urbanism, sustainability, smart growth, pedestrian cities, healthy cities, livable cities, inner-city renewal or the green cities movement—whatever you wish! We must all work together to get our respective downtowns moving in these positive directions. Authors: Roger L. Kemp, Ph.D., ICMA-CM, is a career city manager having served in cities in California, Connecticut and New Jersey. He also served as a planning commissioner. He now serves as a practitioner in residence with the Department of Public Management, University of New Haven. Carl J. Stephani, MRP, ICMA-CM, is executive director of the Central Connecticut Regional Planning Agency in Bristol, Connecticut. He also served as a city council member, city manager and planning director. Roger and Carl are co-editors of a new book titled Cities Going Green: A Handbook of Best Practices, which will be published in 2011.